The Golem project, which wants to turn the vast number of home computers into a supercomputer, has made a few announcements regarding its project development over the past 2 months, including an update on its roadmap. Investors will be pleased to see the bevy of updates and information that has followed the release of the Brass version of their platform. Like the slow-and-steady, Buterin-advised project OmiseGO, the Golem team prefers to take their time with development, settling to release milestones when they’re ready. We don’t hear from them as often as we do other projects, but what communication we do get is meaningful. The project updates we now have give us a better picture of how the team has taken on the ambitious endeavor of creating a decentralized supercomputer, and its efforts to outdo its many rivals. Specific talking points include midterm roadmap goals, a Brass beta patch, highlights from their most recent Reddit AMA, and the release of their first use case on the Ethereum mainnet. We’ve covered the highlights of each of these below. On August 2, the Golem team spoke about the scale of their plans in a detailed blog post, explaining how their understanding of Golem’s implementation has changed as they have been working on it. They call the mid-term roadmap a “roadmap revamp,” which does not replace the original roadmap, but rather communicates their immediate priorities more clearly — a supplementary task-tracker, if you will. The mid-term goals roadmap was revealed via a livestream that covered why it was introduced and how it will manifest. 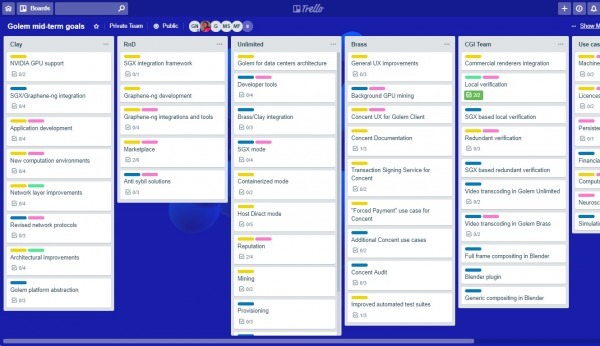 The Golem team has also created a Trello page for these mid-term goals, which divides priorities according to research and development, CGI goals, and use cases, among others. Each of these is further neatly subdivided into sub-tasks, and the team updates progress for each of them. The blog post gets into the nitty-gritty by starting off with integrating the platform with Intel’s Software Guard Extension (SGX) technology, a development that is seen as important for the support and proliferation of blockchain technology. Intel has built this SDK with the aim of improving the security of application code and data. Golem has made it a point to integrate with this technology and, for that reason, marks it as an important goal. The result is that Golem is working with the Intel team to make a customized, open-source version of the development kit that will soon available be for use. This falls unders the “Graphene-ng” project and will remove the need to verify computation locally. Support for Brass beta is also a significant focus for the team. Making improvements and incremental changes will make the project’s transition into the Clay Golem phase smoother (with new use cases using Brass as the default base product). There will be a steady addition of features and products, like the Concent service, and Brass will evolve into a fully usable Clay version of the product. The Concent service is an optional service with the primary purpose of improving security by being an arbiter in disputed transactions. It doesn’t find itself in use very often, but should there be a dispute between a requestor and provider, then the Concent service is called to resolve the dispute. Future versions of Golem will allow anyone to run a Concent node. Requestors and providers agree beforehand to use the Concent service. In doing so, they deposit some GNT tokens that will be used as collateral in case malicious intent is discovered. For example, the node will verify the provider’s results. Should it be correct, it asks the requestor to make the payment. If not, some portion of the deposit is deducted. Tasks in this area include background GPU mining, improved automated test suites, UX tweaks, and Concent-related tasks. The Clay phase, as mentioned, is an evolution of Brass. Expected to release sometime in the first half of 2019, the features that are planned for implementation include the much-anticipated NVIDIA GPU support. This will let users put their video cards to use on the network, which are far more powerful than CPUs for certain tasks. Currently, however, the NVIDIA container runtime is only available for Linux systems. Virtual machines are also on the agenda – these computation environments, combined with a new Task API, will mean that developers can conveniently create and test new applications in sandboxed environments. It will also see improvements to the network layer. The RnD tasklist is business development-oriented. In order to expand, the team will have to actively find opportunities and applications for their platform. The purpose is to find the ideal distributed P2P marketplace for future Golem: fair, secure and that can reflect the behavior of real-world economies. The most interesting task on this list is the creation of a marketplace for Clay Golem, but other developments on the board include an improved reputation system and the consideration of new technologies like Plasma. The focus of this area is to create something like a trusted environment where nodes can group up and perform computations. Each group can decide the details of how computation works, i.e. they will have their own policy. Tasks include job balancing among nodes, reputation, different modes, and virtual cluster management. The CGI team focuses chiefly on different verification methods, like redundant and local verification. The latter works in tandem with the SGX goal to let requestors compute reference images without having to do it on their local machines. Compositing methods are also being worked on, including full-frame and generic compositing. Lastly, a Blender plugin is being developed to make it easier to send processes to the network. The team is also looking into new use cases, like machine learning, financial market analysis, neuroscience, and simulations. The 0.17.1 patch for Brass Beta is one that brings a handful of improvements to Golem Core and the UI/UX. Chief among the changes is the polishing of the UI, which now sports a streamlined interface for task creation. In case a user forgets to add resources during task creation, he or she will now be able to add them to the task creation without having to repeat the entire procedure. 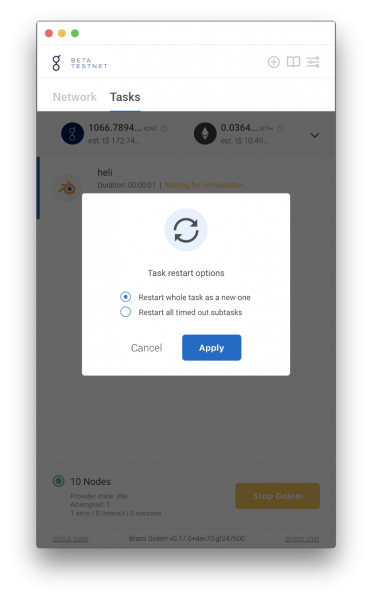 Users will also be able to view the progress of sub-tasks and blacklist nodes through the GUI. Furthermore, payments and income details have been separated into 2 tabs. A notable quality is the ability to partially restart a task that has failed due a time-out, which can save much frustration for the requestor. Other changes include the sharing of performance data between nodes, verification improvements, and improved transaction tracking. The changes are less substantial than the previous patch, version 0.17.0, which brought Netmasking (which prevented an overload of provider requests) and improved Blender verification to reduce the number of false negatives during verification. For those unaware, Blender is a 3D design software that supports the entire design process, from modeling to rendering. Golem uses Blender for the rendering of images, splitting each frame into a subtask. The trouble is, there are potentially several different ways that a malicious provider could trick a requestor into thinking that the rendered image is accurate. The patch reduces the number of instances where this could occur through sophisticated techniques. Both patches fix several bugs. You can download the latest patch here. The Golem team organized a Reddit AMA on September 12. The answers offered give us a window into the team’s mindset, and covered their new use-case pipeline, performance, Concent service, and more. Starting with the release of Clay, the team said that they expect it to be released in the first half of 2019, should everything go according to schedule. The Concent service is under heavy testing. On the other side, the integration with Golem is almost done. It will take about a month to complete the implementation. Then, we will need more integration tests and an internal audit. During this period, we will decide on the next steps and the exact release time. We cannot forecast without the audits and the testing. As an entrepeneur [sic], could you explain some differences in traditional entrepeneurism [sic] and entrepeneurism [sic] in a largely unexplored region like blockchain? Do you notice many differences since you started out in December of 2016? What is your unbiased view on the future of blockchain and dApps in perticular [sic]? We will not see mass adoption before Ethereum solves [the] scalability issue. This is coming but not as close as we all hoped for, so progress seems painfully slow also on dApps front. Truth is that limitations of the technology today result in inferior UX that obscures the benefits you get from building decentralised solution. But with all the talents and money in the ecosystem, we will solve it – it is just a matter of time. It’s good that such attempts take place as it pushes both the technology and the understanding of the domain of trusted execution environments further. Taking it into consideration with an additional strong assumption that the Intel SGX is the most mature of Trusted Execution Environments so far, we want to continue our work just the way we planned. As for other questions and answers, the team touched on the request for new use cases in their use case pipeline post, saying that Golem has received 30 proposals and are actively working on 4 of them. Support for AMD GPUs is also being planned. August and September have been busy months for the Polish team, who have carried out some introspection to better understand what their most important priorities are. Even amongst the many cryptocurrency projects that harbor grand ambitions — let’s be honest, there are more than a few of those — they stand out as having a particularly ambitious goal. The team’s commitment to their goal and the results that show in timely releases of developments is some indication that they might indeed become the first platform to establish decentralized computing (and this, too, is just one step towards their longer-term goal of creating “Web 3.0”). For the moment, however, the Golem team’s primary objectives are to flesh out Brass, make development easier, and integrate new use cases. Their goal of a decentralized internet is many years away, but with the team becoming more communicative and forthright about their work, investors will be happy to see how exactly the project is faring. 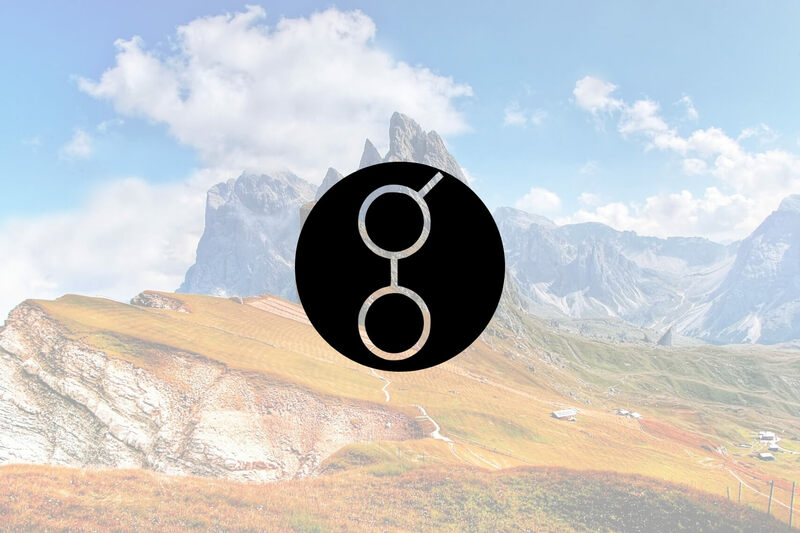 Everything appears to be going according to schedule and — should fortune favor them — they will move on to the Clay Golem phase sometime in the first half of 2019, in which users will be able to rent out their computing resources for several more use cases.